Life is an ongoing journey filled with starts and stops, hellos and farewells, and arrivals and departures. At any given moment, the airport arguably captures this notion about life and the accompanying myriad of human emotions better than anywhere else. During the early morning hours on Saturday, January 6th, 2018 – a frigid day of a record-setting winter marked by extremely low temperatures – the Toronto Pearson International Airport encompassed all those things for Clifford Yeung. A recent graduate of the Public Relations – Corporate Communication (PRCC) post-graduate certificate program, Clifford recently became the first ever Seneca College graduate to be accepted into the master’s degree program in Strategic Public Relations – a partnership with Seneca College – at the George Washington University (GWU) in Washington, D.C. Despite the usual challenges in preparing for a flight, he agreed to meet at the airport and share his perspective on this episode of his journey. 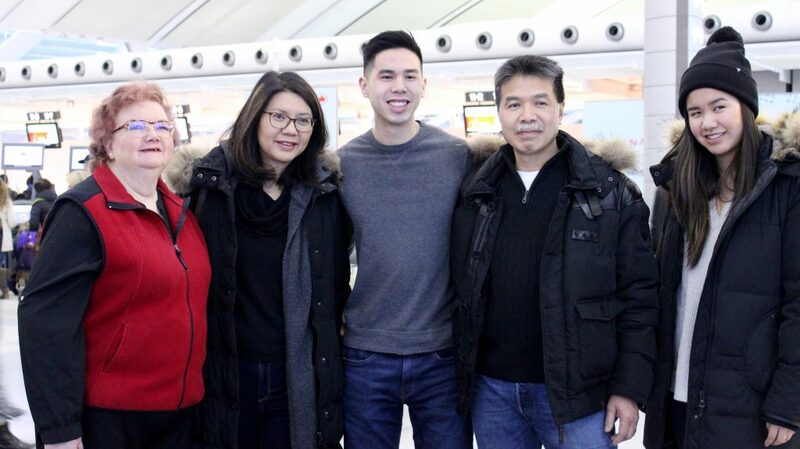 Joined by his parents and his younger sister, Clifford emerged from the crowds and their collective ambience at the Pearson airport at approximately 7:20 a.m. Looking relaxed and dressed in a dark grey sweater and a pair of dark blue jeans, he greeted the six people who had been waiting for his arrival: David Turnbull, a professor in the PRCC program who established the partnership; Beth Agnew, Chair of the School of Media at Seneca; the Seneca Media team; and current PRCC students, Anna Deregowski and Ran Luo. As the minutes passed, handshakes and the exchange of pleasantries gradually made way for rounds of Q&As, the reason this group of people gathered on this day. Clifford would provide nuanced responses to queries from different sources, in a manner that showed glimpses into how the PRCC program challenged and taught him to become a more thoughtful and effective communicator. The occasion simultaneously displayed his confidence and comfort in public speaking and an ability to anticipate questions – important skills for any aspiring public relations (PR) professional. Prior to applying to the PRCC program, Clifford reasoned that the hands-on aspect of the program would “offer me a great foundation for the workforce.” As a PRCC student, he quickly learned that “PR isn’t all tactical, and has a more strategic approach to it. And I really did enjoy doing the strategic exercises and case studies.” This realization, in conjunction with his interest in politics and the creation of the partnership, led him to pick GWU’s Strategic Public Relations program over other options. Situated in the heart of Washington, D.C. – the capital city of the U.S. and its political and arts centre – the GWU is near the Capitol Hill and the White House, offering students of its one-year Strategic Public Relations program the opportunities to gain hands-on learning experience in politics and government relations. For PRCC students who are considering all the pathway options that are available through Seneca, the new partnership – exclusive to Seneca College – presents lowered tuition: by having three Seneca courses transferred in advanced standing, Clifford was able to save around $15,000 USD while reducing his upcoming academic course-load. For a lifelong fan of history and culture like Clifford, GWU also offers easy access to a wide variety of monuments, memorials, museums, and arts and cultural events. Clifford was fully cognizant of the pressure and the expectation that could come with being the first Seneca student being admitted into the GWU program, and viewed it as a challenge. On a personal level, “being the first one, having the pressure, is a great experience for me and will push me to work harder in the program”, he reflected. 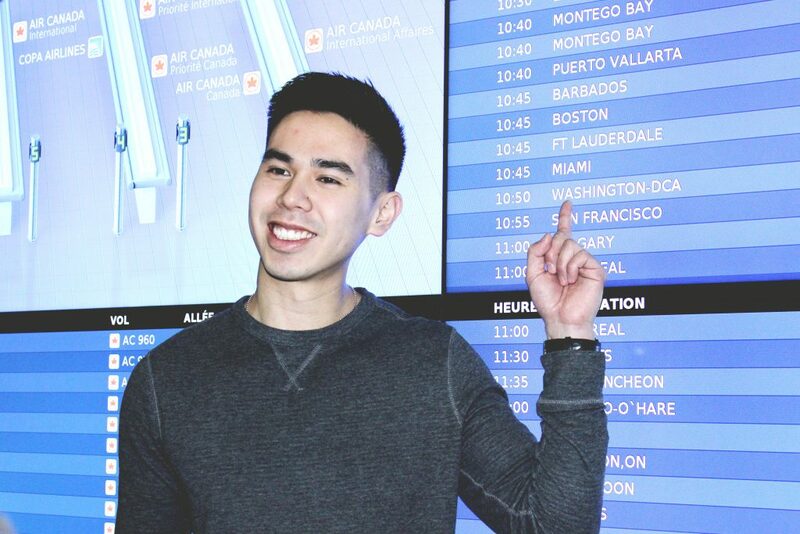 In the grand scheme of things, “I feel a sense of responsibility to represent the school well, not just as a student at Seneca but as a Canadian”, he said, “I hope to be able to create a path for future students… and to show how Canadian students have a lot to offer to international public relations”. Regardless of where, PR as a discipline is a fulltime endeavor, and it requires more than time spent in-class for someone to truly excel. “He stays connected with the news and reads a lot”, said Erin – Clifford’s younger sister – of how her older sibling likes to spend his spare time, “when he goes on his phone, he isn’t checking Instagram, he’s on Politico. When he encounters a topic that I’m familiar with, but he isn’t, he would ask for my opinion.” “He is really in-tune with what’s going on in the world and closely follows the current events”, added Clifford’s mother. As he finished fielding the last question that was thrown his way, there came a quiet moment of clarity for Clifford: the stoppage to the Q&As signified the start of the boarding preparations; the farewells to his former professors and peers would transition into hellos to new faces and networks; the views from the departure gate at the Pearson would soon make way for a different perspective upon arrival at the Ronald Reagan Washington National. Congratulations on your achievement, Clifford, Seneca Media looks forward to what comes next! As in life, PR is a journey that goes on. Ran Luo (@ranaessance) holds a BA in Psychology (w/ a Minor in Sociology) from Ryerson University and is currently enrolled in the PRCC program at Seneca College. He enjoys reading people’s minds and photography when he isn’t busy searching for the next pun.